Priority securable areas require the use of cameras, which not only ensure adequate application functionality, but also will ensure a high level of camouflage entire system monitoring. In view of professional security systems company has developed a reliable HD IP dome cameras enable discreet observation day and night. within the IP network monitoring infrastructures. 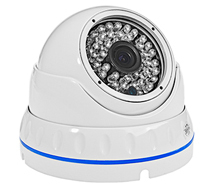 Thanks to its small size and high strength and resistance to external impact of weather conditions IP dome cameras are an indispensable link in any security system vision. and treatment time ranges. Cameras with freely adjustable lenses ensure the effectiveness of monitoring. that automate and give effect to security systems. Modern cameras HDiP use in video recording capabilities wide performance image sensors Panasonic and Aptina. and the high quality of the video recorded in high quality HD and Full HD. The transmitter is a guarantee megapixel clarity and detail of visual protection system. Professional network cameras provide each user with the ability to individually configure the monitoring system based on motion-detection system. which will allow the use of intelligent video archiving initiation when the camcorder detects the moving objects. Personalized observation of each place is one of the determinants of a good monitoring system. The precise determination of security priorities to particular areas of the protected space is possible using the functions privacy zones. With the help of a network IP camera brands HDiP system supports real privacy masks will be directing all attention to the monitoring of critical points of the protected object. One of the many advantages of modern IP cameras brands HDiP is a comprehensive set of advanced features that allow for self-adaptation of the method of observation. Dzięki kamerze z systemem Mirror i ;Flip realne stanie się uzyskanie pożądanego sposoby obserwacji bez względu na ;rzeczywiste położenie kamery. These devices hold a high protection class demonstrating insensitivity to the effects of extreme weather conditions. The thoughtful design of the housing and resistance provide reliable installation of the cameras, even in hard to reach places. 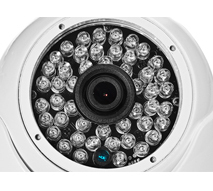 HDIP Dome cameras are the ideal solution for professional security systems.